Some people think Google’s search results pages are getting too cluttered. There’s no question that Google has been adding more elements to them over the years. In fact, just today, Google announced that it is expanding the “Knowledge Graph Carousel,”its visual placement of fairly large Knowledge Graph results directly underneath the search box, to the rest of the English speaking world. Other languages are surely not too far behind.Sometimes, however, it’s simply Google ads that are taking up much of the screen real estate, and as we’ve already seen, Google is showing less organic results for a growing number of results pages. Google’s Matt Cutts participated in an interesting discussion in a Hacker News thread, in response to an article from Jitbit, called, “Google Search is only 18% Search“. Despite the title, the article is really about how little of the screen is used to display non-paid search results for a Google SERP. In the example author Alex Yumashev uses, Google was found to dedicate 18.5% of the screen to results (not including ads). The author found a screenshot from years ago, where Google was found to dedicate as much as 53% of the screen to results. Read the article if you want to get into the methodology, the resolutions, etc. There’s certainly room for debate around some of that, but in more general terms, there’s no denying that Google’s SERPs have changed over the years. Of course, Yumashev did acknowledge that he was looking for a screen with as many ads as possible, indicating that this is specifically about the pages that do show ads. The “help-desk app” query the author used for the first example certainly does have a fair amount of ads “above the fold“. There’s no question that Google is cramming more non-traditional content into search results pages than it used to, particularly with things like the Knowledge Graph, Search Plus Your World, and now the Gmail results, which are in opt-in field trial mode. Google is showing more direct answers, and on a larger number of SERPs, it’s showing less organic results. In fact, Google isreportedly even testing SERPs with less organic results than previously thought. It’s not all about ads (though Google’s revenue certainly is). Chris Crum is a professional blogger and he has been a part of the WebProNews team and the iEntry Network of B2B Publications since 2003. Catch one of the famous IT expert on Twitter here. 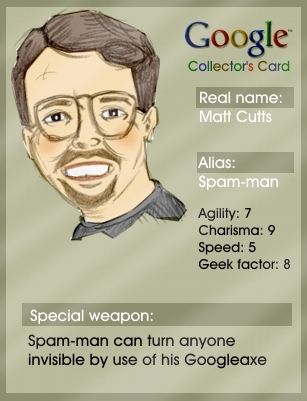 Before commenting on this post , i want to say about Matt Cutts " Matt Cutts joined Google as a Software Engineer in January 2000. Before Google, he was working on his Ph.D. in computer graphics at the University of North Carolina at Chapel Hill. He has an M.S. from UNC-Chapel Hill, and B.S. degrees in both mathematics and computer science from the University of Kentucky." Now come to point on this post "Google would seek to detect that there is no real differentiation between these results and show only one of them so we could offer users different types of sites in the other search results with view of advertisements.Google does try to mirror the real world. We try to reflect the real-world importance of things as we see that reflected in the web. Brands sometimes are an indicator that people see value, but it isn’t the only way that people see value. There are many other possible indicators that something is important and worth surfacing in the search results."